•	may not recognize the symptoms being displayed as responding to the pain stimulus. What is pain? Officially, it is an unpleasant sensory and emotional experience associated with actual or potential tissue damage (1). Yet, because of its complexity, one cannot easily create a definition to satisfy or describe the sensation adequately for all situations. Regardless of the situation, pain is whatever the person experiencing it says it is. Many caregivers emphasize its importance by calling it the fifth vital sign. Pain may be acute or chronic. Acute pain usually has an identifiable source, an injury from trauma or surgery and is not long lasting. The goal is pain relief with rapid onset analgesics, with availability of suitable medication for breakthrough pain. Chronic pain is caused by one or more conditions with a longer duration, lasting six months or longer. The goal here is to achieve pain relief and maintain pain control. With chronic pain, treatment is given regularly in anticipation of pain to preserve maximum function and quality of life at the highest level. Chronic pain can be treated with opioid and/or non-opioid drugs and should be treated around the clock. Alternative treatments such as guided imagery, pleasure foods and nutritional protocols, relaxation techniques, aroma therapy, massage, hypnosis, heat/cold packs, and immobilization have been successfully used for break-through pain. •	Mild pain is treated with Tylenol or Tylenol with Codeine. The use of Darvocet is no longer recommended for elderly people because it takes so long to go through the system; there is risk of higher than therapeutic level in the blood. •	Moderate pain is treated with Percodan, Percocet, Lortab, Vicodin, and Oxycontin. •	Severe pain is treated with Morphine, Dilaudid, Fentanyl and Methadone. Severe chronic pain is managed by nerve severing, implanting pain pumps, and pain infusions. The rule of prescribing medications for the elderly is “start low, go slow”. This means start with the mild drugs and slowly increase the dose based on the effectiveness of the pain medication. How might elderly people show that they are in pain without using words? There are several key areas to assess for pain in dementia patients, non-verbal patients or patients who do not report pain: facial expressions, body position, body movements, moaning or other sounds, changes in level of alertness, mood, appetite, or sleep; and resistance to care. The elderly may respond to the pain by yelling, moving about, or striking out at the closest person or object, a beloved or a stranger. Nursing staff are expected to consider biological needs when assessing patients with dementia. They should check for hunger, thirst, toileting and sleep needs before giving pain medication. State surveyors who annually evaluate nursing homes for care given, policies, staff performance and resident satisfaction align pain management with quality of life. They assign deficiencies in care against facilities who fail to assess, treat, monitor, and document its residents’ pain management regularly and thoroughly. 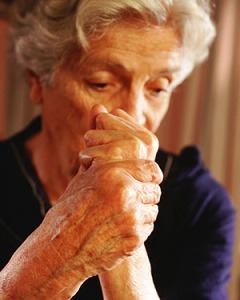 For more information on pain management, try the following organizations and websites: The International Association for the Study of Pain; American Geriatric Society Panel of Persistent Pain in Older Persons; John A. Hartford Centers of Geriatric Nursing Excellence; www.ngna.org; www.amda.com; and www.geriatricpain.org. 1. The International Association for the Study of Pain (2002). Sarah Jean Fisher, MSN, RN-BC, BA is one of Med League’s long term care experts.